Stage 4 out of 5 saw me stop over for a few days in Hong Kong to see a friend. I’d never been to Honk Kong before and it’s fair to say it felt a little like I’d landed in a game of Sim City when I arrived. One hell of an awesomely successful game of Sim City! Every tower seemed taller than the previous one, a majority of which seemed to peak at over 80 storeys high. 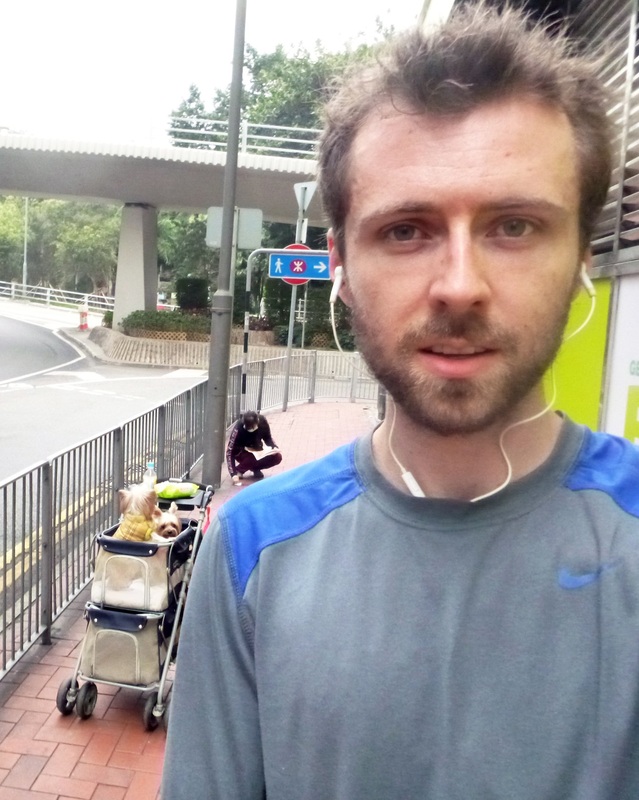 The financial/upper-class residential district bit of HK Island is also built on one massively steep slope which I really wasn’t expecting: it certainly forced me to replace any speed training I’d planned with hill training! Having viewed this monster slope, I somewhat revisited my initial plan to run up from the harbour to the Peak (550m climb in just under 4km!) 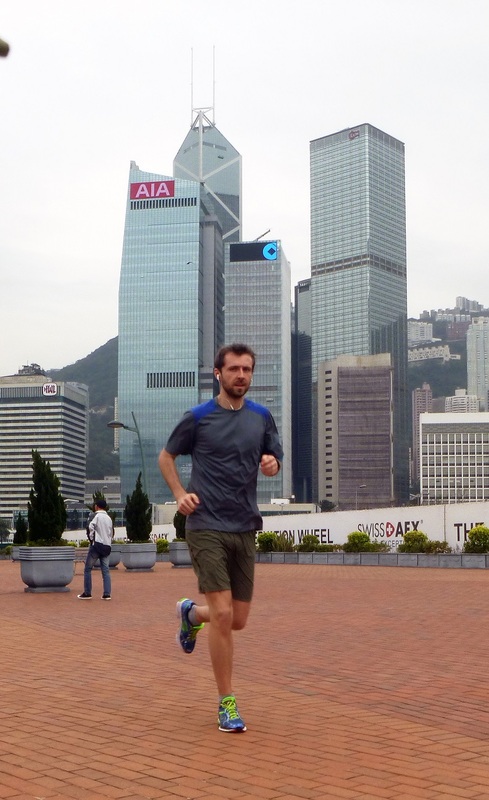 and decided to repeat the official Hong Kong half marathon course instead. It didn’t make the most of all the greenery in wider Hong Kong but it was easier not to get (too) lost and also to avoid having a heart attack. As a lot of the real course goes along the motorway, I thought the only change would be that I’d have to run on a parallel road for some of the course but it ended up slightly trickier than expected! I started off on Temple Street in Kowloon (north of the sea channel) which looked nice and quaint at first sight but, upon further inspection, seemed to have a few more ‘massage parlours’ and gambling shops than initially thought! 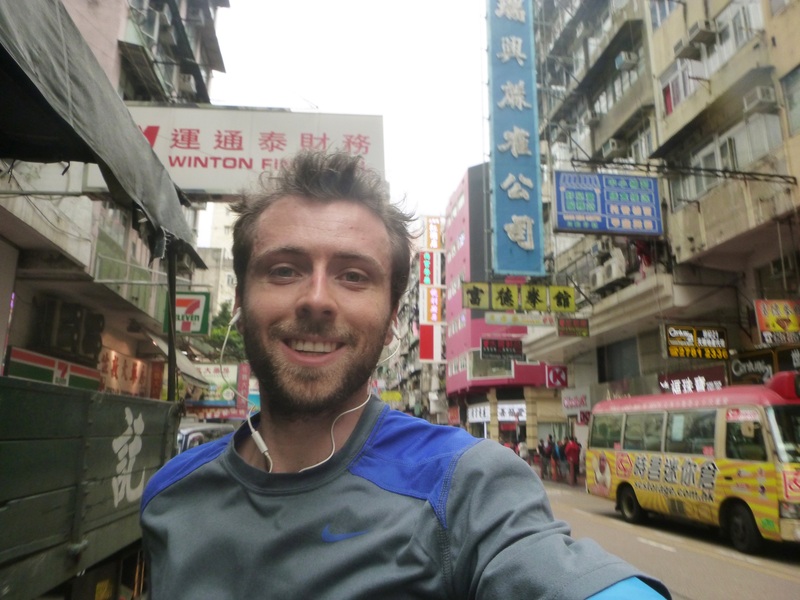 The road quickly became very congested so I moved over to Shanghai St where I ran past a LOT of embalmed seafood shops which, erm, didn’t look very appetising! 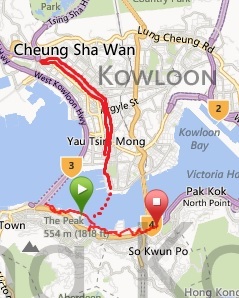 I then ran all the way to Lai Chi Kok Road and back. There was a lot of stop/starting at traffic lights but this was more about the ‘photo-journalism’ opportunity and experience than the speed! 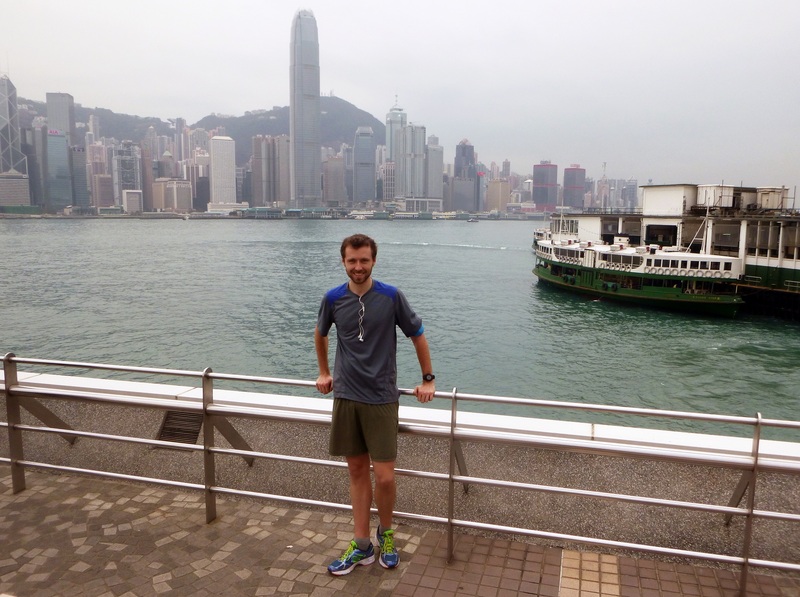 As I reached Kowloon harbour, I discovered a slight issue with my initial plan: the original route which I was going to follow uses a tunnel to go underwater from Kowloon to HK Island. That, I knew. What I didn’t realise what that the road in the tunnel was a motorway and therefore it’d be somewhat suicidal trying to run along it! 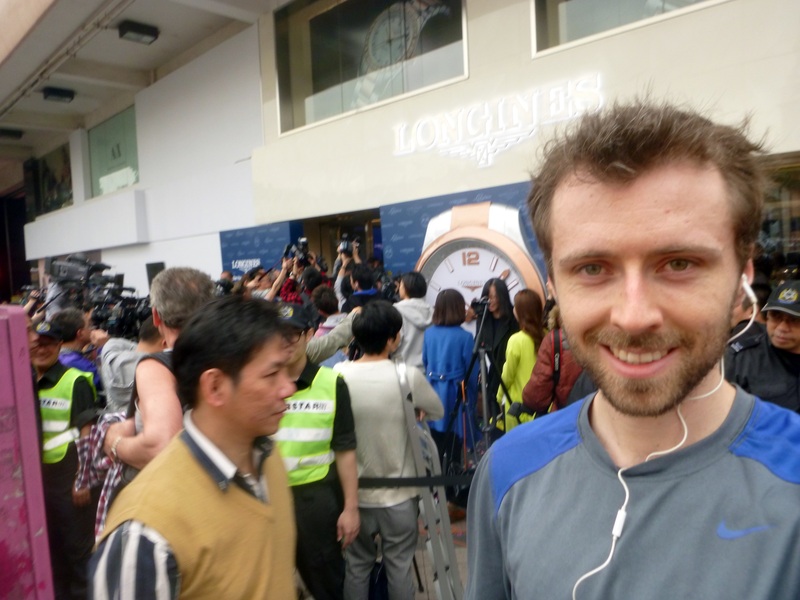 Therefore, like Phileas Fogg when he was in Hong Kong, I used the next best thing to get across: a boat! You’ll be glad to know I didn’t run on the spot on the boat: I look weird enough as it is running around with a map that I didn’t need to draw any extra attention to me. Once I had debarked, I headed west towards Sun Yat Sen Memorial Park before doing a U-turn and returning back along the reclaimed land seafront (it was flat! No hills!) all the way to Victoria Park. It was a little stop-start and I got a little lost trying to cross roads, use the pedestrian walkways and avoid crazy taxi drivers. On the way, there were plenty of entertaining sites/sights to keep me busy: some very funky HSBC building to the humungous Bank of China building, probably too many Filipino ladies of the night on street corners and endless rows of Prada/Dolce Gabbana shops. All of these, obviously, and the lady pushing her dogs in a pram!